Cadillac Fairview (CF) unveiled plans today for a new pedestrian bridge across Queen Street to better integrate CF Toronto Eaton Centre with the Hudson's Bay and Saks Fifth Avenue flagship locations in downtown Toronto. Construction is slated to begin this month. CF sees the project as a significant investment in, and contribution to, the public realm by replacing the existing structure with an exciting new connection between two major retail landmarks, creating a more integrated CF Toronto Eaton Centre complex. 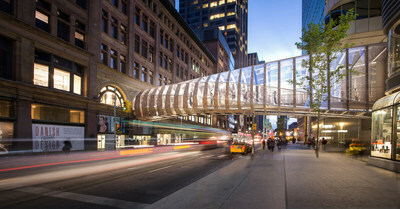 "Beyond the simple utility of construction of a bridge across Queen Street, this pedestrian bridge will serve as a unique architectural icon and impressive space in its own right," said Wayne Barwise, Executive Vice President, Development, Cadillac Fairview. "CF Toronto Eaton Centre is celebrating its 40th Anniversary this year and with approximately 2 million people using the bridge annually, it was time to enhance both its aesthetics and functionality for our shoppers and the public by creating a sculptural urban feature, as well as a unique identifier for the city." The new bridge represents another significant milestone in the redevelopment of CF Toronto Eaton Centre, helping to realize the company's vision of including Hudson's Bay and Saks Fifth Avenue as part of CF Toronto Eaton Centre and its promise of delivering a premium shopping experience. Prior to installation, the bridge will be assembled adjacent to the shopping centre on James Street and lifted into place once complete, with the new bridge opening this fall. CF held an international design competition and ultimately selected world-renowned architects WilkinsonEyre based on its exemplary design (design pedigree) and relevant experience. Featuring glass and etched bronze cladding panels, the structure will provide memorable vantage points for both users looking outward and street-level pedestrians looking up at the new bridge. The effect is one of creating a feeling of engagement between levels and the two retail destinations. "We designed the bridge's form to connect together the two inherent geometries of each building, transforming from the historical, circular arches of the Hudson's Bay and Saks Fifth Avenue building to the modern rectangular geometry of CF Toronto Eaton Centre. This union of the two buildings is further reinforced by the use of bronze and glass cladding, inspired by the materials used on both buildings, which flow, wave-like in opposite directions across the bridge," according to Dominic Bettison, designer of the bridge and Director at WilkinsonEyre. "This meeting and blending of the two building's form and materials becomes a beautiful and metaphorical 'handshake' extending out over Queen Street." 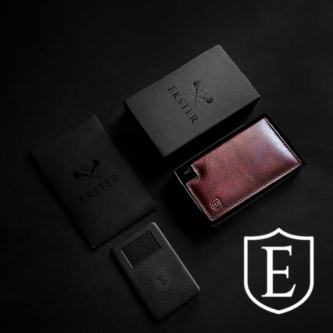 Working closely with WilkinsonEyre is local Architect and longstanding property partner, Zeidler Partnership Architect, who designed the original bridge and CF Toronto Eaton Centre (in association with B+H). Other partners involved in the bridge redevelopment include: Construction Manager, PCL Construction; Electrical & Lighting Engineer Mulvey & Banani International Inc.; Structural Engineer; Read Jones Christoffersen Consulting Engineers; and Mechanical Engineer, Mitchell Partnership Inc.
Cadillac Fairview is one of the largest owners, operators and developers of best-in-class office, retail and mixed-use properties in North America. The Cadillac Fairview portfolio is owned by the Ontario Teachers' Pension Plan, a diversified global investor which administers the pensions of more than 300,000 active and retired school teachers. The real estate portfolio also includes investments in retail, mixed-use and industrial real estate in Brazil, Colombia and Mexico.